Bolivian newspaper Página Siete has published photos of the ongoing construction of the Villa Tunari–San Ignacio de Moxos highway inside of the Isiboro Sécure National Park and Indigenous Territory. The current active construction continues work that began before the enacting of Law 266, which ends special protections for the territory, on August 13. The prior activity, revealed by indigenous residents was clearly in violation of Law 180 of 2011, which the new law repealed. A timeframe of 180 days is established for the elaboration of a Protection Plan for TIPNIS, the Integral Plan for Transportation in TIPNIS, and the Development Agenda for the Indigenous Peoples of TIPNIS to Live Well, in accordance with the results of the Consultation. Insofar as those documents are approved, the instruments of planning and management of TIPNIS shall be applicable, so long as they don’t contradict that which is established in this law, and in agreements resulting from the Consultation. Right now, of course there is no Integral Plan for Transportation in TIPNIS, nor has any highway been designed in a participatory manner. Whether before or after the passage of the new law, the Bolivian government shows no sign of following the legal limits on its road building in TIPNIS. An assembly of Bolivia’s departmental Civic Committees has called on the government of Evo Morales to re-route a controversial highway to the east of the Isiboro-Sécure National Park and Indigenous Territory (TIPNIS). 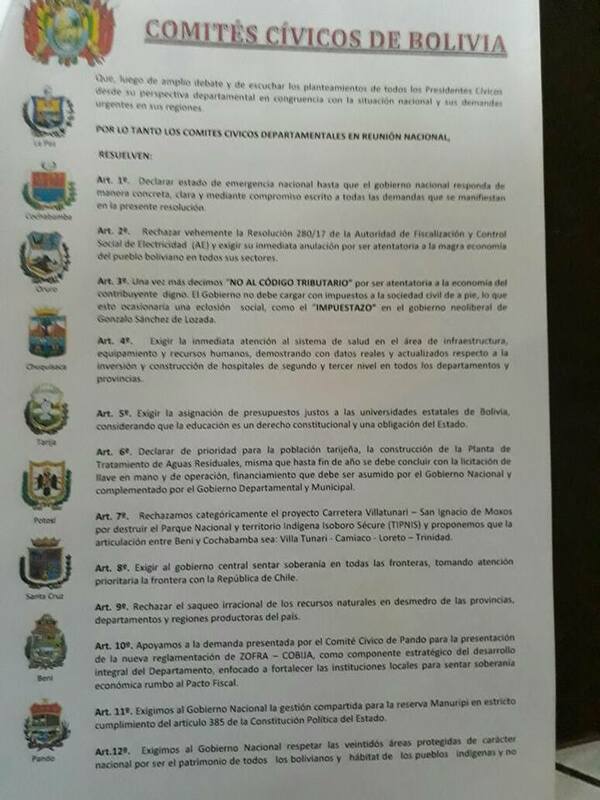 In their joint statement issued on July 20, the establishment organizations write, “We categorically reject the Villa Tunari-San Ignacio de Moxo highway project for destroying TIPNIS and propose that the connecting of Beni and Cochabamba should be [instead] articulated along a Villa Tunari–Camiaco–Loreta–Trinidad route. Rechazamos categóricamente el proyecto carretero Villa Tunari-San Ignacio de Moxos por destruir el Parque Nacional y Territorio Indígena Isiboro Sécure (TIPNIS) y proponemos que la articulación entre Beni y Cochabamba sea: Villa Tunari-Camiaco-Loreto-Trinidad.” This alternative route is one of several that has long been ignored as the Morales government pressed to build a highway northwards out of the coca-growing Chapare and directly through the national park, inhabited by Mojeño-Trinitario, Tsimané, and Yuracaré communities who have campaigned against it for over a decade. I last reported on these option in 2012, when the Isiboro Sécure Defense campaign estimated that the route (number 2 on the map below) would be 250km in length, about 50km shorter than the project underway. Bolivia’s civic committees are coalitions of mainstream organizations, equivalent to an amalgam of a Chamber of Commerce, assembly of government officials, church leadership, and charitable organizations. While in the 1960s and 1970s, they played a key role as an independent voice for civil society amid Bolivia’s military dictatorship, they emerged as a right-wing counterweight to the Morales government in 2005. The right-wing civic movement encompassed committees in the eastern and central provinces, while civic committees in Potosí, La Paz, and Oruro have tilted leftwards. 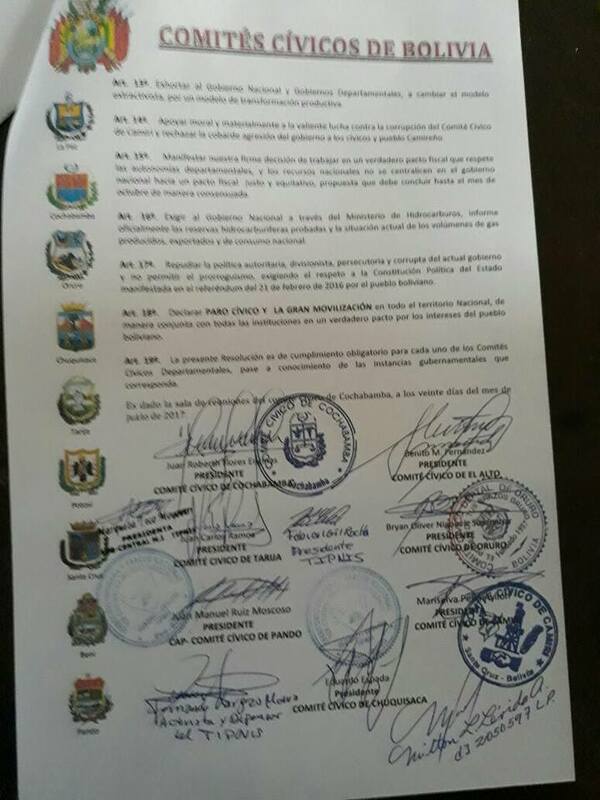 (Oruro and Potosí civic committees have organized important protests making regional demands of the national government.) This week’s report of a joint statement represents an important new voice in the ongoing conflict. It builds upon an alliance of indigenous and center-right project skeptics that backed Carmelo Lens in the 2015 governor’s race in Beni department. 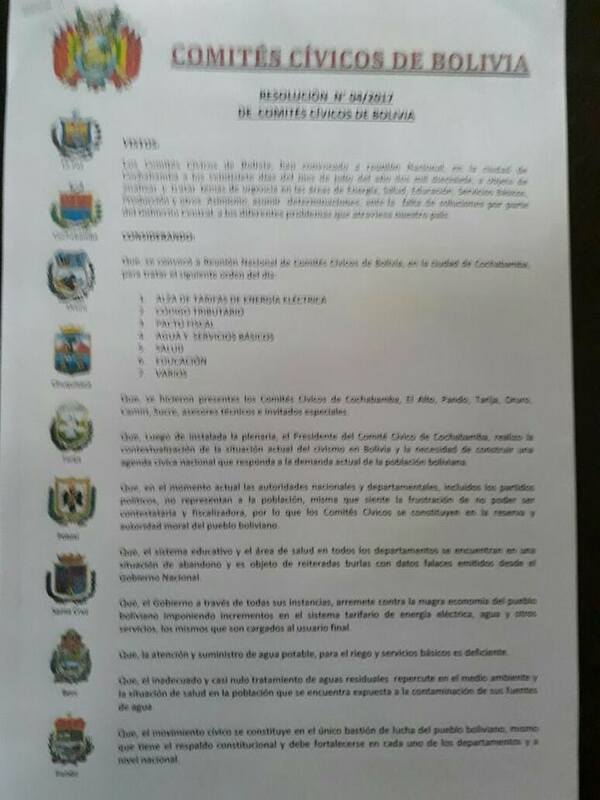 As can be seen below, civic committees from Cochabamba, El Alto, Tarija, Oruro, Pando, Camiri, and Chuquisaca, issued the statement, in cooperation with TIPNIS leaders Fabian Gil, Marqueza Teco, and Fernando Vargas. Images of the resolution provided by Lelponi Maria Alba Guillén de Vargas. Prior and subsequent events belie that description. Ramona Moye and Carlos Fabricano, who are married, have been publicly repudiated by indigenous community members within for their involvement in the 2012 pro-highway march and affiliation with the pro-road MAS party. In April 2015, Moye had her visit to TIPNIS disrupted by a traditional leader and a young community member who allegedly stole her outboard motor to prevent her from campaigning for Beni gubernatorial candidate Alex Ferrier. Moye complained to the press: “How is it that I can’t enter my territory? … they prohibit me, and take away my motor, and threaten that I’ll never be able to return there again. Cómo pues yo no voy a poder entrar a mi territorio, si he nacido allá, si soy de allá, soy una indígena de allá y que ellos me prohíban y que me quiten el motor así con robo y amenazas porque eso fue lo que ellos me hicieron a mí, me amenazaron que nunca más podía volver a allá (a Nueva Lacea), por lo tanto me hicieron un robo.” The Subcentral Sécure has been divided into factions led by Carlos Fabricano and Emilio Noza since at least 2012; Fabricano’s wing took over the organization’s office in Trinidad, Beni in 2014. Since the December 2016 gathering of affiliates of the Subcentral TIPNIS, the new leader of the Women’s Subcentral, Marqueza Teco, has taken the lead in opposing the highway project, while the newly elected male leader Domingo Nogales Morales has had a lower profile in the press. In April, the women’s organization reportedly occupied the office of the Subcentral Sécure within the park. The early July announcement has prompted new reactions from opponents of the highway through TIPNIS. Fernando Vargas, past president of the Subcentral TIPNIS has spoken out against the legislation (video|La Razón) Then, on July 12, representatives of at least ten indigenous communities and the Women’s Subcentral occupied the Subcentral TIPNIS and publicly de-recognized Domingo Nogales as their leader (video|Los Tiempos). “He is no longer president of TIPNIS because he committed such a serious crime within the territory and its communities; therefore, they have elevated the vice president of the subcentral [Fabian Rocha] to president of the Subcentral TIPNIS | Ya no es presidente del Tipnis por haber cometido un delito tan grave dentro del territorio y las comunidades, por lo cual le suben al vicepresidente como presidente de la subcentral del Tipnis,” Emilio Noza told reporters by phone. Such changes of leadership in Bolivian organizations are often precursors to mobilization. In this case, they match calls by both Fernando Vargas and Marcial Fabricano (a founder of the Subcentral TIPNIS and former president of the Confederation of Indigenous Peoples of Bolivia) to reorganize the indigenous movement. As we enter the seventh year of the controversy, the TIPNIS highway continues to be a flashpoint for indigenous and environmental mobilization in Bolivia. Image: Women’s Subcentral of TIPNIS President Marqueza Teco at indigenous territories summit in May 2017. Update 1: Despite the legal prohibition on Segment II, TIPNIS community members have recently shared photographic evidence (taken on July 17, 2017) that the government is actively building bridges inside of the Territory that would become part of the highway. Update 2: After the passage of Law 266, construction of the highway appears to have accelerated. This is happening despite provisions in the law which require the elaboration of transportation plan for TIPNIS and consultation with residents.